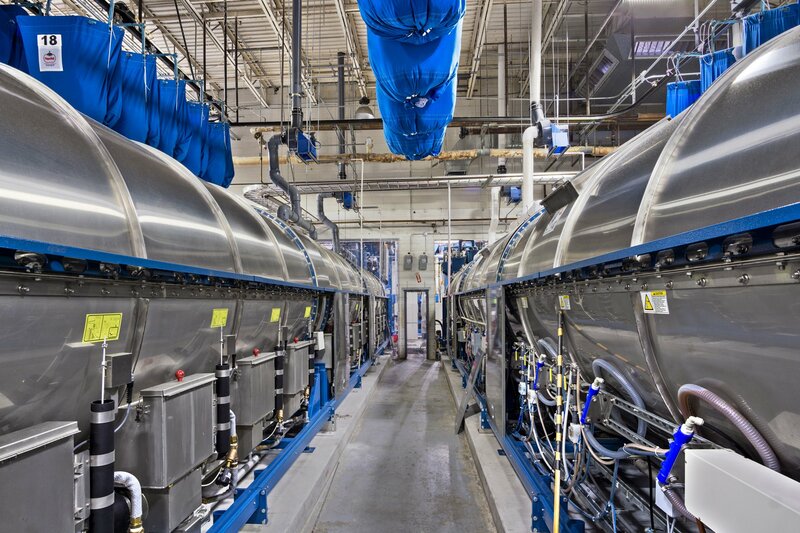 Unlike stand-alone facilities, on-site laundries have a different set of constraints. They are often landlocked in the basement of a hotel or hospital with restricted access, limited floor space, and minimal clear height. Often equipment decisions are made based on what will fit in the space, not what is the best fit for the laundry’s needs. Here’s a list of options that on-site laundries should consider when thinking about upgrading. If you don’t have the pieces in place – strong management, reliable workforce, and well maintained equipment – to process your linen effectively, outsourcing may be a good option. This option eliminates additional capital investment and opens up valuable space within the hotel or hospital. Just remember that once you outsource, you’ve signed over control of your linen quality and delivery to a third party. So choose wisely when selecting your outsourcing partner. 1. Can I get the old equipment out? 2. Can I rig the new equipment in? 3. Will the new equipment fit in the space where the old equipment used to be? If you answer “No” to any one of these questions, then equipment replacement may not be practical. Perhaps you can renovate or expand by using adjacent space for laundry processing. For example, your laundry is located next to a maintenance shop with higher ceilings and easier access for equipment installation. You convert this space into a new soil sort and washroom area, and move the maintenance shop to a different location. • Proper clear height and space for modern equipment and greater automation. • Improved production flow and efficiency. • Lower operating costs and utility consumption. • Ability to expand to take on additional volume. • Ability to replace/upgrade equipment without future disruption. • Repurpose on-site laundry space. Moving your laundry off-site does require a greater capital investment, and you will incur delivery costs to shuttle goods to and from the laundry. However, this option provides an effective long-term solution if you are committed to doing your own laundry. Even if your laundry is located in the basement, you still have options when it’s time to upgrade. The key is to ask good questions, fully understand the answers, and then choose the best solution for your needs.